Ever notice how when you hit a particular club, well it becomes suddenly very dear to you? They can come and go in seasons. For a while, I felt like playing every shot from my 5 iron. No idea why. I just hit it well every time. So I wanted to drive with it, hit my second shot with it, chip with hit. Heck, why not? Turn it around and putt it in with a 5 iron. Then my 5 iron abandoned me one day. I hit it fat and left a divot big enough to bury a squirrel. A big, fat squirrel. I hate that club now. Tried out a new driver today. 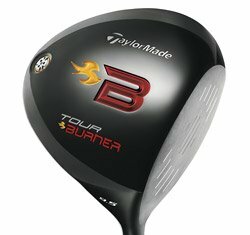 TaylorMade Tour Burner Driver (450cc model). I am in love. Over-the-top crazy in love with this club. I've mentioned this in other reviews, but I'm not an amazing hitter -- especially with the driver. This club felt natural, looked pleasantly like a real club at address (not square or oddly shaped), sounded solid but not too loud at impact, and I'm not exaggerating when I say this: I hit every one long and straight. Oh funny. Someone out there just asked in their head if I hit only two balls. You're hilarious. 9 million comedians in the world and I'm lucky enough to have one of them reading this review. Well for your information, Chuckles, I hit about 16 or 17 drives. No joke. Everyone right down the middle. Everyone longer than I usually hit. Oh, there you are again. A crack about the ladies' tees this time, huh? Funny. You should go on the road with that humor. Look, the point is: I really, really, really liked this club. I could tell it was forgiving. It has that "dual crown" technology that helps with carry and distance. It has a definite lower center of gravity. The "inverted cone" produces a larger sweet spot. Whatever TaylorMade did with this driver, it totally worked for me. I'm going back and buying that driver. The price is comparable to the other new drivers, and for me, it's worth it. Yes. I'm sold. And when I bring it home, I hope it makes my 5 iron jealous and it comes back to me, too.